It can be frustrating for a robot builder when their robot runs into an obstacle or neglects to notice a target item directly in front of it. Even though the human can easily see the barrier or object, the robot may be blind to it because most robot sensors use infrared (IR) rather than visible light. Surprisingly, the opposite is also true. “Clear” materials may seem hazy or black to an infrared sensor. A commonly experienced phenomena is when the performance of an infrared sensor degrades or stops functioning altogether when enclosed in a seemingly clear plastic cover. To summarize: There are materials that are transparent to visible light but that are opaque to infrared, and vice versa. This article describes several quick tests with an ordinary television remote control that can determine if a material passes or blocks infrared light. Based on the test results, you can alter the arrangement of the sensors or modify the material to dramatically improve the robot’s ability to detect objects and obstacles. Hollow plastic eggs are available around the Easter holiday at most grocery stores, party supply stores, hobby stores, and drug stores. You can also order plastic eggs year round from a number of imported toy websites. Several robot contest organizers have selected plastic eggs as target objects for robots since the eggs are inexpensive, light-weight, readily-available, and colorful. Dr. Randall D. Beer, Dr. Hillel Chiel, and Dr. Richard F. Drushel of Case Western Reserve University have taught an excellent course on robotics that uses a robot egg hunt to showcase the students’ creations at the end of the semester. We'll soon see that a robot with infrared photo-interrupter sensors would have a difficult time seeing a hollow plastic egg, because the emitted infrared simply passes through the shell, almost as though the egg were not there. Of course, the plastic egg is simply an example for this exercise. You will likely use these tests on other objects and materials. Most television, VCR, DVD, and stereo remote controls communicate using infrared light. If you need to aim the remote control in the general direction of the device for it to work, chances are it’s an infrared remote control. There is usually a dark lens at the front of the remote control where the infrared is emitted. The dark cover is a good example of a material that is mostly opaque to visible light but mostly transparent to infrared. Steps to test an object for IR transparency with an infrared remote control: 1. Make sure the remote works. 2. Make sure a solid object can block the remote from working. 3. Perform test. 4. Make sure the light is really passing through the object by seeing if it stops working with something solid in the way. For these tests, let’s assume you’re using a TV remote control. Refer to the above image for each step of the test. Aim the remote control at the TV and verify that it is working. Place your hand in front of the remote control to block the infrared signal and verify that the remote control no longer controls the TV. (Don’t wrap your hand over the front of the remote control). If the remote control still works, block it with a coat or book instead, and then try again. If you’re too near the TV, you may need to back away and try blocking again. In that case, you'll need to repeat step 1 to verify the remote control works at the farther distance when it isn’t blocked. Place the plastic egg (or other object of interest) directly in front of the remote control and test to see if the remote control can still control the TV. If the remote control no longer works, then the object either absorbs, redirects, or otherwise blocks infrared. If the remote control still works, then at least some infrared is passing through. This final step is to confirm that the object is the only variable that prevented/allowed the TV to work. If the remote control didn’t work with the object in front of it, remove the object and verify that the TV works again. On the other hand, if the remote control worked with the object in front of it, add your hand (or coat or book) to verify that the TV stops working. These steps are hallmarks of good testing. You establish what “success” and “failure” look like in the first two steps. In step 3, you add a single variable and test the result. Finally, in step 4, you check that the success or failure results can still occur. That avoids false conclusions when something else changed during testing. For example, if the remote control battery died you might think the object blocked the light -- when the remote control actually stopped working. Another example: You might think an object is transparent to infrared when the TV actually was working due to a reflection. Since remote controls can push 1 watt of electrical power through the infrared emitter, the infrared signal can bounce backwards off the object and onto your shirt or the ceiling and then into the TV sensor. So, rather than assuming that the remote control still works because the infrared light is passing through the object, it is proper scientific process to try blocking the light at the opposite side of the object to make sure it really is passing through. To rule out potential test errors, sometimes it is helpful to also try a completely different approach. In this case, we’re actually going to visually observe whether infrared is passing through an object. Humans can’t see infrared directly. 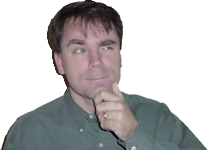 Fortunately, bright infrared sources shows up pinkish or purplish (yes, it’s a word -- I looked it up) in the viewfinder of modern digital cameras. 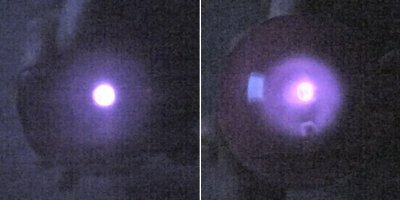 Left: The normally invisible infrared light from a remote control is easy to see in a digital camera. Right: The remote control light passing through a plastic eggshell shows generally the same amount of light, but more spread out. Hold a remote control up to a digital still camera or a digital video camera. In the camera’s viewfinder, observe what happens when you press and release the buttons on the infrared remote control. Now place the test object between the remote control and the digital camera. In the camera’s viewfinder, check if you can see any light passing through the object. In my example, I could still see plenty of pink coming through the plastic eggshell, although it was somewhat spread out. The ultimate test occurs with the actual sensors that a robot is going to use. The next two tests are performed with my track timer boxes that are used for measuring the speed of line following robots (like Jet). One of the boxes is an emitter and the other box is a detector. It doesn’t matter what type of emission sources or detectors are used. The term “photo-interrupter” only concerns the placement of the parts. A photo-interrupter detects objects that block light between the emitter and detector. But, if the object is transparent to the emitter’s wavelength, the detector will still see the light. The egg is invisible to these particular infrared sensors. When set up as photo-interrupter, with an unadulterated plastic egg placed between the infrared source and the detector, the track timer box with the Panasonic detector sensor can’t tell whether the egg is there or not. This is because the detector sees enough infrared light whether or not an egg is present, as the egg allows too much infrared light to pass through it. Use a different type of sensor, such as a visible light photoresistor. Or, reduce the brightness of the emitter until the amount of infrared absorbed or reflected by the object is enough to trip the detector’s state. That is, make it so that the detector barely sees the light without an object, such that even a little bit of interference from an object is enough to block the light. The emitter brightness can be reduced by increasing the resistance of a series resistor connected to the infrared emitter, by reducing the voltage applied to the emitter, or by increasing the distance between the emitter and detector. Or, use a different material for the target object, or paint the object (discussed on the next page). A photo-reflector or reflective-pair arrangement is when an emitter (light source) is not aimed directly at the detector. Instead, the object reflects some light from the emitter and into the detector. A photo-reflector detects objects that bounce enough light from the emitter into the detector. Depending on the angle and shininess of the surface, even a semi-transparent object can reflect enough light to be seen by the detector. 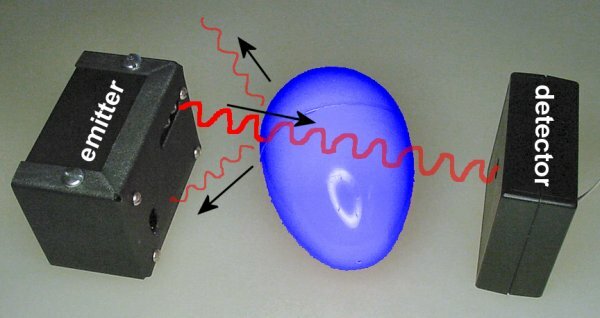 Amazingly, an infrared photo-reflector configuration can detect the semi-transparent plastic egg. Normally, the detector doesn’t see any infrared light because there isn’t an object for the light to bounce off of. But, when the egg is present, just enough light bounces off the shiny surface to reach the detector. The reason that the photo-reflector arrangement can detect an egg but the photo-interrupter arrangement cannot, has to do with the differences in the object-present state of each configuration and the sensitivity of the detector. In a photo-interrupter, it’s darker when there is an object present because it is blocking the emitted light. The opposite is true for a photo-reflector. In a photo-reflector, it’s brighter when there is an object because it is reflecting the emitted light. Since the egg does such a poor job of blocking infrared light and the Panasonic sensor does such a good job of detecting even small amounts of infrared light, we want to choose a setup that emphasizes a brighter state when an object is present. The photo-reflector is therefore more appropriate in this example. If the egg did a great job of blocking light or the sensor failed when even a small amount of light was blocked, then a setup that emphasized a darker state when an object was present would be preferable. 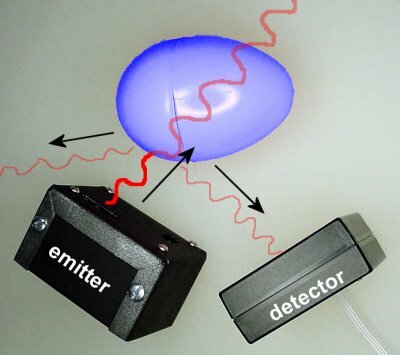 Although this example of a modulated detector and a plastic egg favored a photo-reflector, this should not dissuade you from considering a photo-interrupter for other objects and sensors. These results were limited to the situation where a particular infrared detector is being used (instead of a visible light detector) and that the selected plastic egg is moderately transparent to infrared. Ironically, photo-interrupters are usually more reliable because photointerrupters only rely on opaqueness, whereas photoreflectors rely on surface reflectivity, ambient lighting, and angle. Never assume what you see is what the robot sees. Sensors are peculiar and intolerant. Dispel any initial expectations you have for the sensors. Only program for their behavior after you have personally observed their actual outputs in a specific set of circumstances. Voltmeters and oscilloscopes are excellent diagnostic tools to observe the actual electrical results. It is worth experimenting with the arrangement of sensors to select the best setup for a particular circumstance. Small adjustments and tweaking often determines the difference between reliable success and habitual failure. Let’s try altering the surface of the plastic egg to see if it can be made more opaque to infrared.